Eddie Burns came onto the country music scene in the late 1960s, early 1970s. He was born in Colorado City, Texas. When he was still very young, the family moved to a town named Giddings, just south of Austin. When he graduated from high school, he enlisted with the U. S. Air Force and was also a paratrooper. Musically, he was said to have performed on stage for the first time when he was just ten years old. He started out playing rhythm and blues, but every band he hooked up with told him he would be better off being a part of a country music band. The only problem was getting into that genre. At the time, Charley Pride was just coming onto the scene. But like any other musician who had that inner fire, he didn't let such things deter him. He went to Abilene, Texas where he formed at least six bands a 1972 article noted. He taught many younger musicians as well. He made demo tapes of his efforts which eventually led to his first record. That session appears to have included three songs, "Long Gone Lonesome Blues", "Helpless" and a tune he wrote, "My Lucky Day". That demo tape found its way to Nashville, Tennessee where Shelby Singleton had his Plantation Record label. He liked what he heard and had Eddie fly in for an interview. That meeting led to a recording contract. Eddie appears to have been signed by the Shelby Singleton Corporation to record for Plantation records in early 1970. Clark Bentley was going to produce his first recording session. 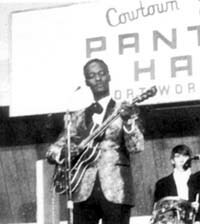 In early 1971, Royce Clark was stated to be completing the direction of an album of tunes by Eddie Burns for Plantation. He made appearances on the Fort Worth television show, Cowtown Jubilee that originated from the famed Panther Hall. He shared the stage with such acts as Waylon Jennings, Hank Snow, Jack Greene and numerous others. The 1972 article noted that he and Kitty Wells put on a memorable show in Abilene, Texas. Of his Plantation recordings, "Color Me Country" and "Southside of Chicago" were the ones that generated the most attention. Billboard listed "Southside of Chicago" as a new release in April 1971. At the same time, Charley Pride was releasing his first gospel tune, "Did You Think To Pray." His recording of "Color Me Country" may have caused a swirl of talk back then. One magazine photo shows a picture of Eddie shaking hands with a DJ named Lloyd Mayberry in Breckenridge, Texas to as the caption noted, "...let bygones be bygones" in Eddie's first appearance in Breckenridge in over two years back then. Roaming around the internet, it appears that a young 15 year old by the name of Danny Ray was part of Eddie's band early on. He went to school during the day and then played with Eddie at night at various country music night spots. Mr. Ray mentioned that Bill Holman played bass. Danny also mentioned being on the Plantation recording sessions as well. Another article by R. Serge Denisoff compared Eddie's "Color Me Country" to some of Woody Guthrie's dustbowl ballads. The song was about a displaced farmer from Texas who "...drives a worn out car pulling a homemade trailer with everything we own..." But it appears the Breckenridge Texas Chamber of Commerce took a little offense to the what Denisoff termed "...this Grapes of Wrath type song." Perhaps an indication of the uneasiness between artist and the genre at that time, the article notes that once fans and journalists alike got to know him, they couldn't help but like him. And similarly, it took Eddie a while to understand the ways of country music people. Eventually, it all comes down to the music and its connection with the fans. Billboard magazine tells us that around the April 1970 time frame, Eddie was doing personal appearances in Texas, New Mexico and Oklahoma. In February 1971, Shelby Singleton was in the midst of realigning his products and personnel. At the time, about 50 percent of the Plantation record label business was in the Pop music field with 25 percent coming from rock music and 25 percent from country music. It was said there was to be new country releases by Ben Story and Eddie Burns around this time. Jim Garland noted in an early 1973 article that Eddie was "...over due for recording, but when he does, "he does"." Eddie made the rounds at the local country music scene back then. He was among several artists who would visit Julian Tharpe after he formed his new group at the Pink Panther Club in Fort Worth. Julian was a former steel guitar player for Ray Price's band. He also did appearances at Ray Chaney's Stagecoach Inn.